The palmette trellis originated in Italy and France and is most commonly used in areas where growers prune and harvest their trees from moveable platforms. Trellis height is 3.0 to 4.5 meters. 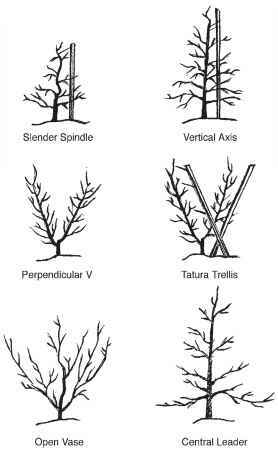 Trees are trained to a two-dimensional form, with branches tied to a horizontal or an oblique position. An adaptation for dwarf apple trees is the Penn State low trellis hedgerow, developed by L. D. Tukey. Several interesting vertical trellises—marchand, drapeau, and Belgian cordon—orient trunks and limbs at 45 degrees to balance cropping and shoot growth. The Lincoln canopy is a perpendicular T-shaped trellis. J. S. Dunn, a New Zealand agricultural engineer, designed the system for mechanical harvesting. Detailed training and pruning are recommended to prevent low-light conditions. Early tests with containment spraying were conducted on this system. The solen is a system developed by J.-M. Lespinasse for acrotonic apple growth habits. The system resembles a T from the side, rather than from the end of the row. Main scaffolds are trained horizontally along two wires, and fruit hang underneath. A horizontal, suspended canopy system, or pergola, is used in Japan for pears. A considerable body of knowledge is available on the performance of tree fruit training systems. Many of the studies show that when rootstock and tree spacing are constant and level of pruning is minimal, early productivity is similar. Degree of success often is due to how well a system is tailored to specific climatic conditions and management objectives. As cultivars change, flexibility also becomes important. A current thrust in training research is to assess natural tree growth habits and fruit quality requirements in order to help growers find the best match between a cultivar and a training system. The systems (Figure T3.1) described in this section are the more common ones found in pomology literature. Many innovative orchardists modify training strategies or develop new designs to maximize system potential. Barritt, B. H. and F. Kappel, eds. (1997). 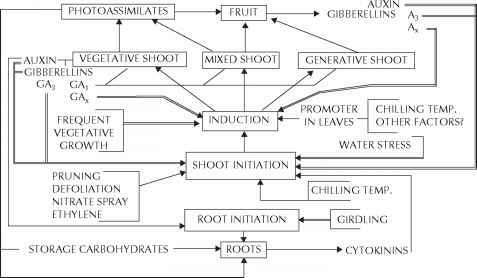 Proceedings of the sixth international symposium on integrating canopy, rootstocks and environmental physiology in orchard systems, No. 451. Leuven, Belgium: Acta Horticulturae. Baugher, T. A., S. Singha, D. W. Leach, and S. P. Walter (1994). Growth, productivity, spur quality, light transmission and net photosynthesis of 'Golden Delicious' apple trees on four rootstocks in three training systems. Fruit Var. J. 48:251-255. Day, K. R. and T. M. DeJong (1999). Orchard systems for nectarines, peaches and plums: Tree training, density and rootstocks. Compact Fruit Tree 32:44-48. Ferree, D. C. (1994). Orchard Management Systems. In Arntzen, C. J. and E. M. Ritter (eds. ), Encyclopedia of agricultural science (pp. 131-142). San Diego, CA: Academic Press, Inc.